"You don't need an ideology to knock over a liquor store." Pity poor Bill (Robert Burke). His elaborate scheme to steal $650,000 in computers goes awry when his partners double-cross and desert him, leaving him with a pittance. It doesn't help that he was in love with one of them, and now she's abandoned him. To make matters even worse, Bill finds out that his radical activist father, who has been in hiding since he was accused of throwing a bomb into the Pentagon and killing seven people, has been arrested. Bill and his brother Dennis (Bill Sage), a philosophy student, converge at their mother's house. Meanwhile, their father has escaped and is once again on the lam. Both sons have their own reasons for wanting to find him, but their mom has only one clue to his possible whereabouts, a photograph with a telephone number and the mysterious word "Tara" written on the back. Dennis learns that the exchange is on Long Island, and the brothers decide to track him down, but there's one problem�not only has Bill given what little money he had left from the failed burglary to his mother, but Dennis has done the same with his scholarship, so they're broke. 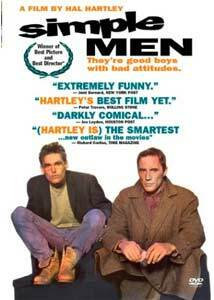 Despite the title, the men in Simple Men are not that simple, and Hartley seems to be saying something about the duality of man (and woman) here. There are two brothers, one of whom is the scholarly, reflective type, obsessed with finding the truth; the other, the man of action who is more concerned with love than philosophy. There are two potential love interests: Kate (Karen Sillas), who takes in the two strangers once they get to Long Island, is the earth mother type, firmly rooted in her home and land; and Elina (Elina L�wensohn), the exotic, aloof stranger from the East. There are even two potential visitors to Kate's house, one (Kate's psychotic ex-husband) to be dreaded, the other (Bill and Dennis' father) to be welcomed with open arms. Despite the obvious pairings in the film, Hartley's film is no single-minded study in opposites, and there's certainly no heavy-handed philosophical message here. Anything but�Hartley, who also wrote the script, populates the film with frequent gentle humor and quirky minor characters, including a nun who desperately tries to hide her smoking habit, and a service station attendant who's learning French to impress a girl who may or may not speak the language. His visual style is fairly functional and not flashy, but he does carefully distinguish between the opening scenes, with their bright, almost surrealistic primary colors, and the off-whites and earth tones once the characters arrive on Long Island. Simple Men is mid-period Hartley. He still hasn't abandoned the rapid-fire, almost monotone dialogue that he favors in his early films, but his increasing skill at creating an involving, consistent narrative from disparate threads is fully in evidence. The basic plot motivation (Dennis and Bill have to find their father), as well as the mystery to be solved (what really happened to him? ), are set up early in the film, and new characters and subplots are introduced and integrated smoothly into the whole. Of course, it wouldn't be a Hartley film if everything was 100% consistent, and just as we've come to accept the film's slightly off-kilter rhythms as something resembling realism, Hartley switches gears and the story grinds to a halt. Martin (Martin Donovan), a friend of Kate's, shouts "I can't stand the quiet!" and we cut to Elina dancing in a bar while Sonic Youth's immortal Kool Thing blasts away on the soundtrack. The rest of the characters join her in a semi-choreographed dance that is both disruptive and exhilarating. While not as consistently successful and entertaining as Henry Fool, Hartley mixes interesting narrative and character arcs with engaging visuals and a great score (written by himself under the pseudonym 'Ned Rifle') to great effect in Simple Men. Image Transfer Review: The image looks quite good, with lots of detail, no edge enhancement, and no compression artifacts. There are deep blacks and shadow detail, and the colors are bright, if a bit flat in some scenes. Skin tones are accurate. Audio Transfer Review: The two-channel sound is open and contains a reasonable amount of bass, which allows the Hartley-penned score to come through clearly. There's no activity in the surrounds. Extras Review: The five-minute featurette is mostly fluff, with brief interview snippets with Hartley and some of his actors. There's a cheesy 4:3 DVD trailer for Sunset Grill, as well as the original theatrical trailer for Bodies, Rest & Motion, also in 4:3 with a soft transfer. In his fourth feature, writer/director Hal Hartley combines an interesting, mystery-driven plotline with quirky characters, his own score, and a judicious choice of indie songs to create an engaging whole. The transfer is very good, although the extras are minimal.